Nutrition has been described as the relationship between diet and health. It has also been said that nutrition is the fuel for the entire body. When food enters the body, it is digested into small enough particles to nourish the cells or it becomes waste. Once food is deemed unusable waste by the body, it must be stored or eliminated. Nutrition as a science is only about 100 years old; however the study of food and its effect on the human body is as old as the study of medicine. 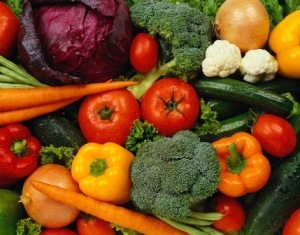 Fresh, healthy and preferably organic fruits and vegetables are an important part of your overall healthy eating plan. They are high in vitamins, minerals and fiber and low in fat and calories. Eating a variety of fruits and vegetables may help you control your weight and your blood pressure. Keep it colorful. Challenge yourself to try fruits and vegetables of different colors. Make it a light green/red/dark green/white and brown day (pears, strawberries, spinach & almonds) or a orange/white/green/red day (Carrots, jicama, lettuce and tomatoes) or see if you can consume a rainbow (all the Chakra colors) of fruits and vegetables during the week. Enjoy vegetable dippers. Chop raw vegetables into bite-sized pieces. Try jicama, carrots, cucumbers, broccoli, cauliflower and celery, and dip your favorites into natural dressings. Dip tip: Read the food label of sauces and dressings to make sure they are not overloaded with saturated fat and salt. Whole grains! Whole grains are generally good sources of dietary fiber. Dietary fiber from whole grains, as part of an overall healthy diet, helps reduce blood cholesterol levels and may lower risk of heart disease. Fiber-containing foods such as whole grains help provide a feeling of fullness with fewer calories and so may help with weight management. B vitamins (thiamin, riboflavin, niacin and folate) play a key role in metabolism. Folate (folic acid), one of the B vitamins, helps the body form red blood cells. Magnesium is a mineral used in building bones and releasing energy from muscles. Selenium is important for a healthy immune system.